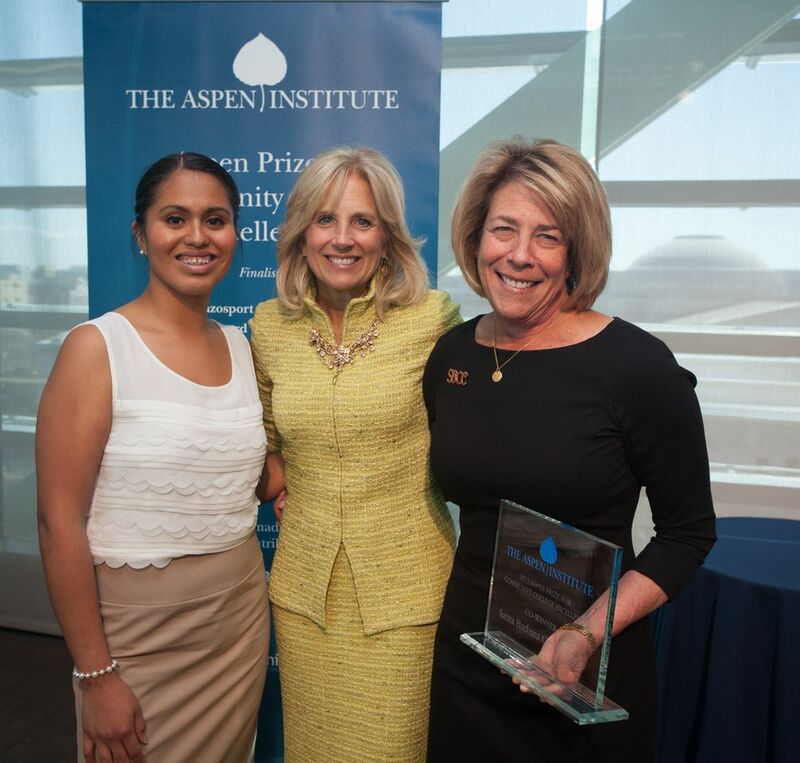 SBCC student Edith Rodriguez (left) with Second Lady of the United States Dr. Jill Biden (center) and SBCC President Lori Gaskin (right) at the Aspen Institute luncheon on March 19 in Washington, D.C.
By at least one measure, Santa Barbara City College is the finest community college in the nation. On Tuesday, a delegation from SBCC learned at a ceremony at the Newseum in Washington, D.C., that the school had won the Aspen Prize for Community College Excellence, awarded by the Aspen Institute. SBCC tied for first place with Walla Walla Community College in Washington state. The two institutions will split the $800,000 prize. SBCC President Lori Gaskin remarked that $400,000 is a whopping big chunk of change, but, she said, “It’s not the money that’s important. It’s the fact that everybody at the college has worked so hard to do whatever they can to help our students achieve their dreams. This is external affirmation of that.” The Aspen Institute only invites 120 colleges to apply for the prize before whittling them down to 10 finalists. City College was also a finalist last year. The prize committee was impressed with SBCC’s transfer rates, especially for underrepresented students. Almost a third of the college’s enrollees are Hispanic, and 48 percent of its Hispanic students graduate or transfer within three years as compared to a national average of 35 percent. The average salary for a SBCC graduate five years after attaining a two-year degree is $43,000. As part of the selection process, the Aspen Institute flew out and interviewed SBCC student Edith Rodriguez, an aspiring engineer and alumnus of the Running Start summer bridge program for financially or academically underprepared high school seniors. The awards were presented by John Engler, former Michigan governor and current president of the Business Roundtable, and Richard Riley, former U.S. Secretary of Education. The two feigned a debate about which college most deserved the prize before announcing it was a tie.